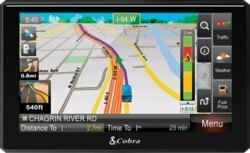 The Cobra 8500PROHD 7" GPS Navigation System provides additional features that keep drivers safe and updated on the road. Rest Stops and Much More. Limited Return within 14 Days of purchase or 5 days after delivery with a 15% restocking Fee. Note: Scratch or damage the GPS in any way and you bought it. There is a $100 manufacturer's fee for returning a GPS that is anything other than pristine new condition. Note*: The warranty does not include the glass face.